It's honestly a rare condition that people needs to convert DVD in PAL format since boatloads of DVD players are designed as one-size-fits-all kits to serve for you nowadays. Chances are that 90 out of every 100 NTSC DVD players are capable of playing PAL DVD—the only caveat is it is region free! Part One: When Needs to Rip PAL DVD to MP4 AVI MKV MOV? Case: when you plan toplay a European or Chinese commercial DVD in pal format on an American NTSC player, they may be unable to successfully watch it on their DVD players since PAL (Phase Alternating Line) format is common for Europe and Asia and NTSC (National Television System Committee) is a Color TV standard for the United States, Canada, Japan. The inherent difference and other factors decide the PAL DVD unreadable on most American DVD players and vice versa. Solutions: All roads lead to Rome. You can alternatively play the digital copy of PAL DVD on media players as they are not confined with the so-called region codes. Thus, ripping and converting PAL DVD to the media player acceptable video format is a crying need. Effective Tools: When it mentions DVD ripper for Mac, the first tool appears on your radar might be the well-known Handbrake, for it's 100% free for you to rip DVD to MP4, MKV on Mac/Windows with several clicks. But you have to install the third party VLC to assist Handbrake since it can't rip any encrypted DVD on its own. And it's highly easy for you to have the Handbrake VLC 2.0 problem, Handbrake crashes halfway and video audio out of sync problem. 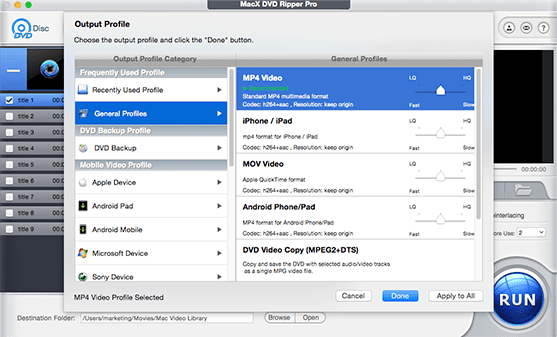 Comparatively speaking, the world-renowned MacX DVD Ripper Pro is the much better choice for you to remove region codes from PAL/NTSC DVD and convert it to MP4, MOV, AVI, MKV, etc on Mac OS X (macOS High Sierra), so as to be compatible with both PAL and NTSC media players (for North America, Japan, South Korea, Taiwan, Philippine). With this L DVD ripper in hand, you can play your PAL DVD anywhere anytime without worrying any incompatibility issue. And its windows version is fully compatible with Windows 10. And what makes this tool a household name lies in its unparalleled DVD decrypting tech that is competent to remove any copyright protection tech infused in any DVD, like the latest Disney X-project protection, Sony ARccOS, let alone the PAL or NTSC region code, CSS, UOPs and more. Step 1: After free download, and run this amazing DVD ripper on Mac (You can also get its Windows version, click "DVD Disc" button to import the PAL DVD movie. Alternatively, you can also load DVD folder by clicking "Path" button. Step 2: Choose MP4 as output format from the "Output Profile" drop-down box. If you what to copy PAL DVD to DVD, choose ISO image. Step 4: Click the "RUN" button to start converting DVD movie to MP4 on Mac OS with this top DVD ripper, you could view the conversion progress and are able to cancel the converting process at anytime. And it's mentionable that ripping and copying DVD is encouraged for personal legal use, not for any illegal reproduction or distribution of copyrighted content. Please abide by your local copyright law and respect others intellectual property. 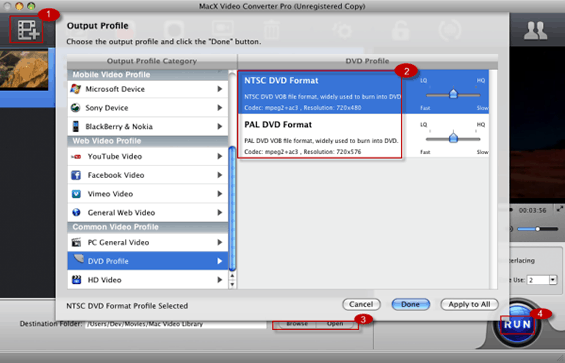 Part Two: Why Needs to Convert PAL to NTSC DVD Format? Q: I have a PAL DVD rip I want to burn, but I want it to burn as NTSC. I have American blank DVDs so would it convert to NTSC upon burning or would it make the DVD a PAL because of what I'm burning to it? In any case, is there a simple way to do what I'm wanting to do? A: Similar to the questioner, the reason why people prefer to rip and convert PAL to NTSC format is that they would like to burn a NTSC DVD for collection or eternal storage. And the simple way to do this is beyond count. But the simple yet faultless way is relatively in much smaller amounts. Grounded on my personal experience, I introduce you with a dead-easy yet flawless way to achieve this goal-that is convert a movie from PAL to NTSC format with a world-class video converting pro MacX Video Converter Pro and then you can smoothly burn your NTSC format video to a blank DVD. Outshining its rivals with the incomparable High Quality Engine and hyper-threading tech, this tool can empower you to convert any video with 1:1 lossless quality. In this way, you can burn your PAL DVD to a blank NTSC DVD with highest possible quality. Step 1: After free downloading and launching this video converter on Mac, import the PAL video by clicking the button at the top left corner. You can add more than one file at one time. Step 2: Choose "NTSC DVD Format" from the DVD profile, and then click "Done" button. You can preview the video through the preview window. Note: The PAL DVD is recorded with 720×576 resolution and 25 fps while the NTSC DVD is designed with 720×480 resolution and 29.97 fps. You're supposed to adjust the resolution and frame rate. Well, it automatically makes that for you with the ideal default settings offered. Step 3: Click the "Browse" button to specify output folder on your computer to save the output files. Step 4: Click "RUN" button to trigger the PAL to NTSC conversion on Mac. After a few minutes, you can garner your desired NTSC DVD video and burn it to your blank NTSC DVD disc for storage. Is that all of its features? Of course Not! Highly acclaimed as Swiss Army Knife, MacX Video Converter Prro also functions as a strong performer in converting both SD and HD video including MP4, MOV, AVI, FLV, MKV, AVCHD, MTS, etc. And also the top-rate YouTube video downloader and converter is able to perfectly download and convert standard video and 720P 1080P, even 4K ultra HD video from YouTube with solely a few mins. NTSC and PAL are two television encoding systems that rule the world at present. What are the differences between NTSC and PAL? Is it worth you ripping DVD from PAL to NTSC or NTSC to PAL? Electrical power system: the electrical power is generated at 60 hertz in America applying the NTSC signal while compared with NTSC, PAL signal used in Europe takes 50 pulses per second. Resolution Quality: What distinguishes PAL from NTSC is the resolution. The former has a resolution of 720*576 pixels while the NTSC in 720*480. Others: the PAL has lower frame than NTSC but has better image quality than NTSC. Got some Redbox DVDs and want to copy them to your hard drive or watch them later? This article introduces you a guide to rip Redbox DVD movies to MP4, MOV, AVI, FLV, MKV etc. for free. The list of output file format MacX DVD Ripper Pro supports is a mile long, including PAL DVD to MP4, MOV, MKV, AVI, MPEG-2, ISO image, etc. It's also able to copy PAL DVD to iPhone 7/Plus, iPad Pro, Galaxy Note 7/S7 edge, etc. 350+ mobile devices.